Johnny Moon represents a new direction for Mike Palecek. 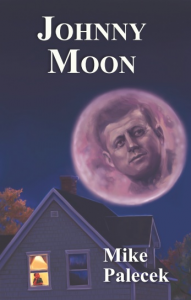 Straying from his traditional emphasis on present-day or near-future adult protagonists who end up in prison when they refuse to kowtow to the powers that be, Palecek’s new novel features Johnny Moon, a likable 1963 schoolkid. Johnny, his schoolmates, Sister Mark and the other faculty, and a couple of workmen one of whom has been living in the basement of the Catholic school. 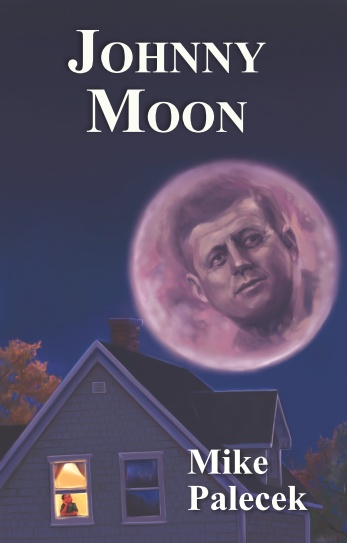 The unlikely cast of characters are involved in an even more unlikely scenario: the boiler may actually be a time machine, the nuns aliens, and President Kennedy’s death may not have been the act of a lone Communist gunman. Reality mixes with the absurd and it’s often hard to tell the difference. Johnny didn’t set out to be the leader of an underground club. He just wanted to win a physical fitness award and maybe he would get to go to the moon. The President had caught his imagination and that of the whole country. It was a magical time when it seemed that anything could happen, and probably would. Americans would lead the whole world into a wonderful new age of freedom and prosperity for everyone. Or not. The privileged and corrupt few who really run the world were just not going to let that happen. And those who saw, who realized there was something ugly underneath the facade–those people had best keep out of sight, keep their mouths shut, hear nothing, just like those famous monkeys. Because if they did see, hear, or speak of evil, it just might come to visit them and they would probably not survive the encounter. All this is not what Mike says in his new book. Not exactly. Certainly not explicitly. But it’s what I got out of the highly disturbing experience of reading it. The first thing I told my friends who asked what I thought of Johnny Moon was that I thought I liked it. They said, “You thought…you aren’t sure?” And I told them that when I got to the end I didn’t feel sure of much of anything anymore. I wasn’t completely sure what happened, in the book or while I was reading it. I had somehow gotten lost in that space between conscious and unconscious, reality and surreality. It was as if I’d returned to the sixties in my own time machine, and anything was possible again. But the evil ones were not hiding any more as they did then. The evil was in plain sight for anyone who allowed themselves to see. Johnny Moon is frightening and enchanting, fringe and mainstream, young and old, crazy and sane. It’s maddening and frustrating and I’m very glad I read it.